I don’t think I have ever blogged before about my actual bearded men illustrations, so I thought I would share what Inspired me to create them and why I did it. After a few emails from people asking me about them I thought I would put together a little blog post. I started drawing my bearded tattoo men back in 2009 for an exhibition, they then disappeared into the ether of the million and four sketchbooks I have. They were re-discovered only recently and “big pop” which is my best seller was created. Inspired by my dads beard and tattoos that I use to draw a lot of tattoos as a teenager and I decided to to combine the beards and the tattoos to create my bearded tattooed dudes. I just started doodling more in my sketchbook more and more enjoying the details after so long of feeling like I had lost my way but the beards and tattoos keep me inspired. 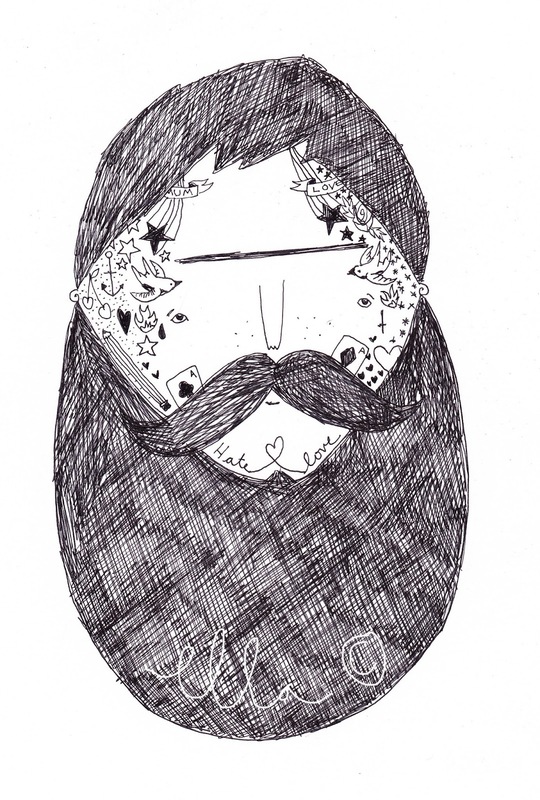 My bearded men can be found over at ella masters illustration etsy shop. For the actual illustrations I use a fine black pen called a pilot G-TEC C4 , i use this pen as it doesn’t bleed to much when water is introduced and I find it very comfortable to draw with. I draw onto different kinds of paper, but for the big pop style illustrations I use fabriano 300 gsm watercolour paper it is my ultimate favourite paper, such a massive art/stationary geek. My Watercolours are windsor and newton pan watercolours, I bought my watercolour set for £40 as a graduation gift but you can pick them up really cheaply. You can find a bit more out about the watercolours here at the Windsor and Newton website. 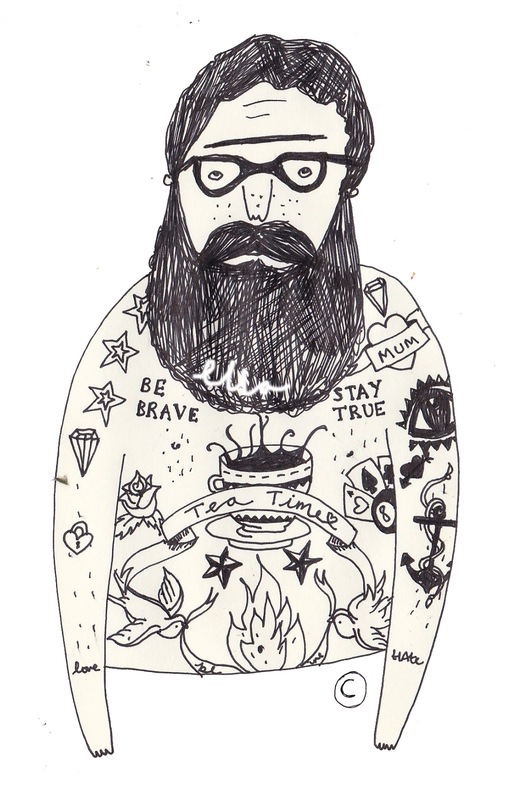 I am currently working on new bearded tattooed dudes, as we speak expanding the dudes to new things. I am currently inspired by patterns, the sea and bright colours so lets see where this takes me. Also this week on bloglovin I am number 1 art blogger in the UK, how amazing thank you so much! Next Post Places to Visit in london : Jessie Chorley and Buddug columbia road. 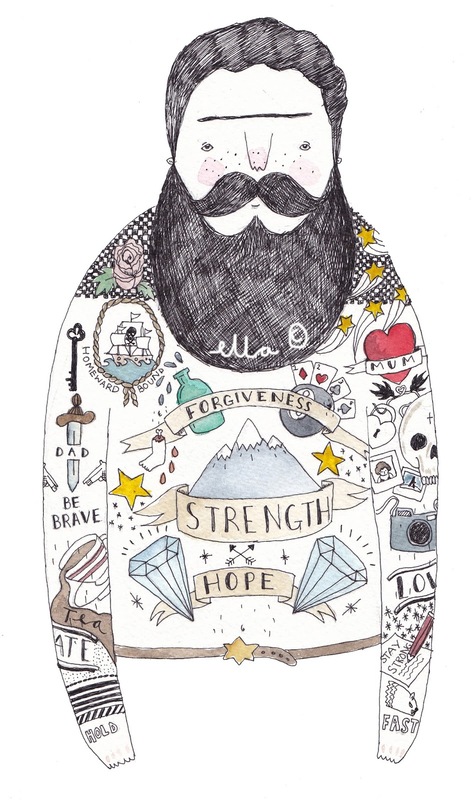 I love the bearded man, great illustrations. I'm off to check out your etsy shop now!